He is leading the Research Group on “Computer Vision and Aerial Robotics” at U.P.M. within the Centre of Automatics and Robotics (C.A.R. ), whose activities are aimed at increasing the autonomy of the Unmanned Aerial Vehicles (UAV) by exploiting the powerful sensor of Vision, using cutting-edge technologies in Image Processing, Control and Artificial Intelligence. He has been head director of over 40 R&D projects, including R&D European projects, national R&D projects and over 25 technological transfer projects directly contracted with the industry. He is author of over 180 international scientific publications and nine patents, three of them registered internationally. 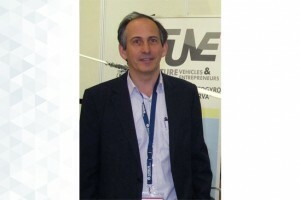 He is awarded several international prices in UAV competitions: IMAV12, IMAV13, IARC14 and IMAV16. The Power Line Inspection Software (PoLIS): A versatile system for automating power line inspection. Engineering Applications of Artificial Intelligence. Vol.71. Pages: 293 - 314. A Multi-Layered Component-Based Approach for the Development of Aerial Robotic Systems: The Aerostack Framework. Journal of Intelligent and Robotic Systems: Theory and Applications. Vol.88. Pages: 683 - 709. A review of deep learning methods and applications for unmanned aerial vehicles. Obstacle Detection System for Small UAVs using ADS-B and Thermal Imaging. Journal of Intelligent and Robotic Systems: Theory and Applications. Vol.88. Pages: 583 - 595. Análisis por técnicas morfológicas y secuenciación de ADN del polen atmosférico de la Comunidad de Madrid: estudios preliminares. Revista de Salud Ambiental. Vol.16. Number. 1. Pages: 71 - 77. A reliable open-source system architecture for the fast designing and prototyping of autonomous multi-UAV systems: Simulation and experimentation. Journal of Intelligent and Robotic Systems: Theory and Applications. Vol.84. Number. 1. Pages: 779 - 797. A Vision-based Quadrotor Multi-robot Solution for the Indoor Autonomy Challenge of the 2013 International Micro Air Vehicle Competition. Journal of Intelligent and Robotic Systems: Theory and Applications. Vol.84. Number. 1. Pages: 601 - 620. HISTORICAL EVOLUTION OF THE UNMANNED AERIAL VEHICLES TO THE PRESENT. Dyna (Spain). Vol.91. Number. 3. Pages: 282 - 288. SIGS: Synthetic Imagery Generating Software for the Development and Evaluation of Vision-based Sense-And-Avoid Systems. Journal of Intelligent and Robotic Systems: Theory and Applications. Vol.84. Number. 1-4. Pages: 559 - 574. Vision-based steering control, speed assistance and localization for inner-cityvehicles. A general purpose configurable controller for indoors and outdoors GPS-Denied navigation for multirotor unmanned aerial vehicles. Journal of Intelligent and Robotic Systems: Theory and Applications. Vol.73. Number. 1-4. Pages: 387 - 400. An approach toward visual autonomous ship board landing of a VTOL UAV. Journal of Intelligent and Robotic Systems: Theory and Applications. Vol.74. Number. 1-2. Pages: 113 - 127. Monocular Visual-Inertial SLAM-based collision avoidance strategy for Fail-Safe UAV using Fuzzy Logic Controllers: Comparison of two Cross-Entropy Optimization approaches. Journal of Intelligent and Robotic Systems: Theory and Applications. Vol.73. Number. 1-4. Pages: 513 - 533. A hierarchical tracking strategy for vision-based applications on-board UAVs. Journal of Intelligent and Robotic Systems: Theory and Applications. Vol.72. Number. 3-4. Pages: 517 - 539. A vision-based strategy for autonomous aerial refueling tasks. Robotics and Autonomous Systems. Vol.61. Pages: 876 - 895. Identification and cascade control by nonlinearities reversion of a quadrotor for the Control Engineering Competition CEA IFAC 2012 | Identificación y control en cascada mediante inversión de no linealidades del cuatrirrotor para el Concurso de Ingeniería de Control CEA IFAC 2012. RIAI - Revista Iberoamericana de Automatica e Informatica Industrial. Vol.10. Pages: 356 - 367. Vibration reduction for vision systems on board UAV using a neuro-fuzzy controller. On-board and Ground Visual Pose Estimation Techniques for UAV Control. Journal of Intelligent and Robotic Systems: Theory and Applications. Vol.61. Number. 1-4. Pages: 301 - 320. Omnidirectional vision applied to Unmanned Aerial Vehicles (UAVs) attitude and heading estimation. Robotics and Autonomous Systems. Vol.58. Number. 6. Pages: 809 - 819. Unmanned aerial vehicles UAVs attitude, height, motion estimation and control using visual systems. Autonomous Robots. Vol.29. Number. 1. Pages: 17 - 34. Visual 3-D SLAM from UAVs. Journal of Intelligent and Robotic Systems: Theory and Applications. Vol.55. Number. 4-5. Pages: 299 - 321. Soft-Computing Based Visual Control for Unmanned Vehicles. visual tracking, pose estimation and control for aerial vehicles. On-board visual control algorithms for Unmanned Aerial Vehicles.